How many Tariqas are there in Daghestan and are all of them true? We have talked about it before that there are different kinds of Tariqas and that every kind of them have definite tasks (Wirds). It was also mentioned that every Tariqa has its Imam, like the four Mazhabs, and that not everyone has the right to teach Tariqa. There are several branches of Tariqa in Dagestan too. Such branching within Islam must not surprise anybody, especially within Tariqa. True theologians do not doubt or question this fact for they know that there is hidden wisdom of Allah in it. The Almighty ties a man together with what he was created for, having created favorable reasons for it. A man welcomes the chosen fate for himself as the rightest, the best and the truest be it actually good or bad. It does not mean that God forces some men to do good and others to do bad. The Most High does not like when His slave enjoys indecent way of life and He does not order to do so. The deeds which a man chooses for himself here on the earth are the choice made for him by his essential particle (Zarrah) initially. It is necessary for us to comprehend it. For that very reason we must beware of thoughts like, “Why has Allah prepared such a fate for me and not another one?”. Dear Muslims, I have started this conversation because some unenlightened people regard Islam in unduly form, seeing above-mentioned branching and existing disagreement within Muslim community. Such attitude towards Islam is inadmissible. Why? Because Islam is a treasure, there is nothing more pure or precious than it. What will come out of accusing such a pure path foreordained by Allah if people cannot follow it in due form? A reasonable man will not turn his back to Islam and will not admit any smallest accusation towards it. May Allah make Islam sweet for those who strive for it! كُلُّ حِزْبٍ بِمَا لَدَيْهِمْ فَرِحُونَ} سورة الروم :32} . Just like everywhere else and every time, in Daghestan too there are separate groups of people who follow different kinds of Tariqa and they are glad with their choice and consider it to be the truest of all. Also there are people with generally positive attitude towards Tariqa and earlier Shaykhs in Daghestan, however they deny the possibility of their existence today. Thus these people assert that with the approach of The Doomsday neither Murshids nor Tariqa can exist. Also there are people who never believed Tariqa, rejected it and accordingly accused people entering Tariqa of disbelief and idolatry. These people are Wahhabies. May Allah save us all from their convictions! Both of the above groups think that only their conviction is the rightest and the truest. But actually only Allah knows what is the rightest way. May be we shall know about it too, when we appear before Him. They say that there is as much talk as you speak, and there will be as much cloth as you have measured. No matter how much we talk about these branches, our conversation will be far from finishing. Whatever way looks right it is impossible to unite all Muslims around it. The situation was like this before us too. Therefore I leave responsibility for each chosen way with those who have chosen it and with the help of Allah I shall tell about the way I have entered. Everyone like me may tell about himself, for there are people who can speak much better than me. But you, dear Muslims, do not confine yourselves to the things I or others like me tell you, but pay attention to our deeds as well, for the things which are pronounced by our lips and our actions must correspond to Shari`ah and to contents of authentic books. Having duly analysed the things and having chosen the true path it is necessary to follow it. May Allah bring you, dear Muslims, to the true way however difficult, may He endow you with the strength to follow this way! The easiest of Tariqa ways and the purest from innovations, leading a man to knowing Allah through His grace is considered to be Naqshband Tariqa and after it is Shazili Tariqa. The base of these Tariqa ways comes to us from The Prophet (pbuh) himself through the uninterrupted chain. I follow the Shaykhs who belong to these two Tariqahs, and I teach it others according to what I have been taught by my Ustazes. There are also a lot of people who reject these two Tariqahs as well, and each of them give their arguments. For instance some of them as we have mentioned before, consider Tariqah a needless innovation. Along with it they liken Shaykhs to idols. May Allah save us from such people! Other people acknowledge Tariqah and previous Shaykhs but extremely oppose today’s Tariqah basing their position on the idea that today there may be no any Shaykhs and perfect Murshids. Others assert that no teacher should teach them mentioning Zikr and pronouncing Salawat because they can do it themselves. There is another group of people who consider that the Ghazawat in Daghestan has ended with Imam Shamil and Tariqah with ‘Abdurrahman Sughuri, and after him there is allegedly no Tariqah in Daghestan. So what is the truth? Those who assert that Tariqah is an innovation and pin a label of disbelief and polytheism on Sufis are the followers of ‘Abdul-Wahhab who appeared on the earth in more than one thousand years after origination of Islam. We have talked on previous pages about the path created by them. ((من سنّ سنّة حسنة فله أجرها و أجر من عمل بها)). It is interesting to know why do people who think that Tariqah is an innovation do not consider the result to which Tariqah brings people, not to mention the fact that Shari`ah has been sent down on the basis of Tariqah. We shall talk about the issue of allegedly Tariqah “leads people to polytheism” later on inshaAllah. Statements of those people who consider that true Shaykhs existed only in the past and that they do not exist nowadays are baseless and contradict religious sciences, books and sound reason. نسبتي هذا تبقي بواسطة أولادي إلى يوم القيامة، و الإمام المهدي يكون علي هذه النسبة. "البهجة السنية"
“Naqshband Tariqa will exist up to The Doomsday through my followers. Imam Mahdi will complete this path”. Saifullah-Qadi said, “Shazali Tariqa will prosper in Daghestan day after day”. Thus there was no time when Murshids were absent and there will be no such period, inshaAllah! Furthermore, the words that there will be no Shaykhs contradict The Qur’an and The Sunnah. I shall agree with those who assert that there are no perfect Shaykhs nowadays, relating these words to myself because I am not worth a bean of previous Shaykhs. Then a question may arise about whether such man may teach Tariqah. Before answering it I have to ask a counter question about whether any rich man may hire a poor man for giving out his alms if he is honest and good mannered? Is there any difference or anything unlawful if a rich man gives out alms himself or charges a poor man with it? The answer for these two questions is that there is no difference and the alms may be given out in any of these ways. Surely such answer will not be opposed by anyone for there is no reason for it. So if alms may be given out like this, what is there inadmissible if a perfect Murshid charges another less perfect Murshid with resuming discipleship? Another example, there is a need to pave a water channel from a spring to a certain place, using golden trough/gutter as a material. At some distance there is a shortage of material, what do you do? Instead of losing the water, is it not better to use, lets say, gutters made of wood? So if from the spring gushes forth pure water, uncontaminated with different kinds of impurities, can we say that the water cannot be drank as it runs through wooden gutter? I think you will hardly find people who will argue that it is impossible to attach wooden gutter to a golden one, and drinking such water is impossible. There is no reason for such an argument. If it is possible to attach wooden gutters to golden ones, for supplying water and drink it, what is the argument for prohibition of Tariqah propagation among people? More so because the chain (Silsilah) which comes from The Prophet (pbuh) is alive and reaches us without changing of its base and there are Shaykhs comprising this chain? Is it correct to assert that one should not spread Tariqah because today’s Shaykhs are imperfect? I do not see any reason for not spreading it today. There are many people who ask whether it is possible or not to perform Zikr and recite Salawat by themselves without mediation of a Shaykh. The answer is the following: it is possible to perform Zikr and read Salawats by people themselves without Shaykh. But if we ask about what is the difference between Zikr made by oneself and the Zikr under a Shaykh’s instruction we shall find answer through the following examples. Every man in this world has his own specialties of housekeeping. Some of them are engaged in trading in markets, others in agriculture, others go shepherding, etc. Whatever way of life a man chooses he always seeks for an easier way of getting more use of it. And it is obligatory. Why? Is it enough for a man to simply sit in the market without watching over income-expense ratio? The aim of buying and selling is making profit. What will be the final profit of a man who does not understand the difference between commerce which gains twenty cents from a ruble and the one which gains a ruble from a ruble? As this world is the field to be sowed for the Hereafter and its crop is service to The Most High Allah, so we shall not find there anything except what we have succeeded in doing in the worldly life. Will it be not best for us to keep to the way, the service in which is of a greatest use for the Hereafter? As we have mentioned before we may give still many examples about the difference between Zikr and Salawat performed out of one’s own free will and under a Shaykh’s instruction. For example a man is ill. In order to recover he tries to get use of somebody’s advice, he reads medical literature, takes measures by himself but does not visit a doctor. However he is ignorant of his disease as well as of the right medicine. Another man with such decease visits a doctor, undergoes laboratory tests, gets an X-ray and a diagnosis and gets a doctor’s course of treatment. This is how a man who does not understand difference between these two ways of treatment may ask such question: what is the difference between performing Zikr - under a Shaykh’s instructions and without Shaykh, all by oneself! One more example. A certain gardener or horticulturist consults an experienced agronomist, chooses a plot of land and looks after it following his advices. But another one does not know where to plant a tree, what grain and when to sow and how to look after it. At the same time he does not consult an agronomist and looks after his lot all by himself. What do you think, who of them two will get more profit from the land? A man who does not see a difference between them will again ask the same question about what is the difference between the ways of performing Zikr and Salawat: by oneself or under a Shaykh’s instructions! Another example. A man builds a house for himself on a plot of officially allotted land for building. His work over building a house will not be wasted because the plot for building belongs to him by the law, he has got it by authority, it is lawful for him (Halal). Along with it he has building materials also acquired legally. Let us suppose that there is a man who also starts building a house not far from him but illegally, also using illegally acquired building materials. People after looking at these two houses from distance will say that - what is the difference between these two, they look just the same? At first sight they will be right for these two houses resemble each other outwardly. However these places may be visited by a state commission at any time. They may come to the master of the first project and check the ownership’s documentation on the land, the house and the building materials. For this man the checking will be all right. Then will come the turn for the second house-owner. It will come out here that the land has been occupied without permission, the source of building materials is unknown and there are no necessary documents. Here he will be investigated under a criminal case and the case will go to a prosecutor’s office. Finally he will have to face a trial. So here the difference between the two houses is revealed! Those people who have acquired the land by bribes and built houses at the expense of stolen materials and false documentation will find themselves in the situation which has happened to the owner of the second house. In the end they also appear before the court, for a lie always comes to light. Evil and deceitful deeds always manifest themselves. Dear brothers in belief, Muslims! There is Zikr of two kinds: trained Zikr (Ta’lim) and inspired Zikr (Talqin). Ta’lim – is a kind of Zikr which parents teach to children or when competent people teach it to incompetent ones. We may teach by this way and it is useful. A man who has built illegal house will have to appear before the court in this world. Accordingly, a visible [outward] way of service to The Most High may exactly be like this, and turn out to be useless or still even worse: it may take such a turn that you will have to answer for it at the Great Judgement. A way of performing a task [without assistance], by way of mining from books or from competent people is called Shari`ah Wird. The second kind of teaching Zikr is Talqin. It is a special task which is taught only by a man who has a right for it. As we have mentioned before no matter how competent a man is, this kind of Zikr is to be transmitted only by a man with permission and order for it. At times we can meet books in which it is stated that Ustaz of those men who have no Ustaz is The Prophet (pbuh), i.e. a Salawah recited on The Prophet (pbuh) replaces Ustaz. Also you can hear statement that if you have no Ustaz your Ustaz is Shaitan. How should we understand it? The meaning of the words that Salawah recited upon The Prophet (pbuh) replaces Ustaz is the following. If there is no man who would teach Tariqah and it is impossible to find him then it is better to recite Salawah by oneself. What else should a Muslim do in this situation: sing songs?! This does not mean that if there is a possibility to find a man who would teach Tariqa there is no need to visit him and you can do with mentioning Zikr independently. Why? Because Imams of Tariqas assert about necessity of finding Murshid who will teach Tariqah even if your expenses will be equal to that of performing Hajj. Here you must understand that these words do not mean that you should seek for Ustaz instead of performing your obligatory Hajj. A man who performs task (Wird) i.e. Shari`ah Wird, is compared by `Arifun, scholars who have approached to knowing Allah, with a millstone which rotates just on one and the same place. It follows from this comparison that such man has no progress. Thus we know from the given example that in order to travel on an unknown way it is necessary to have a competent guide. But it does not mean that we diminish his personal role. The words that if a man who has no Ustaz will have Shaitan as Ustaz, have the following meaning: in the result of such sovereign service this man will find himself under the dominion of Shaitan. Shaitan cheats the servant without being noticed by him. Furthermore, hidden diseases of his soul has influence on him no matter how intensive his service for The Most High is. Shaitan even helps him to intensify his service but the diseases of his soul intensify together with it too. What diseases are they? These diseases are: Riya’, Sum’a, Shukhra, Ujbu, Takabur which display themselves as self-conceit, wishing to show oneself being good in people’s eyes, vanity, pride, desire for fame and glory and etc. If we talk about Zikr which is taught by Ustaz it has a number of advantages. One of them which I have heard from great Shaykhs is the following. A man comes to the Plain of Judgement (Arasah) with all his service he had performed independently, without any teacher. The size of his deeds is like an enormous mountain. Here his debtors gather around him. Some of them claim that this man had stolen their things, taken away or held by force. Others say that he had slandered or abused them. In other words no matter how small sin he had committed, made use of somebody’s land or threw a stone into neighbor’s dog, every one of these people will demand their dues, whatever small or insignificant it had been. Then the mountains of his service corresponding to his deeds will begin to disappear. Then it is said from the side of The Most High to debtors, “This man has no more good deeds by which he could pay you off”. Then they will ask that they give him their own sins instead of receiving good deeds from him. After that mountains of sins will accumulate around this man and with them on his back he will have to go to The Hell. Therefore there is a risk of having the case turned into a similar situation and many people will suffer from it. However if a man performs task taken from Ustaz, nobody may touch his reward and it remains for him. And debts of those people whom we mentioned before will be recompensed by The Most High Himself. One more example. Certain manager orders his subordinates to gather fruits from trees for winter. He sends them specialists possessing knowledge of the right fruit gathering and preserving. But due to their absence of knowledge the subordinates begin gathering them anyway and dump all the fruits in one place. What will be the result if the specialists are not consulted, and different fruits’ harvesting and preservation peculiarities and conditions are not taken into account? But along with it there are people among them who have got some knowledge from competent people who taught them right harvest gathering. For example it might be so that some people have gathered unripe nuts in summer. Then they are explained that the time has not come for nuts yet and therefore it would be better to harvest apricots, and that they would also teach them to dry apricots, thus preventing their loss in work. Then they would tell them what fruit is better to dry and which is better to sell in order to get more profit from the harvest. Then comes the time for walnuts. It might turn out that people have gathered nuts together with its upper and bitter peel. Here again they will be prompted that this peel is of no use and it is better to get rid of it in the course of gathering. Certainly they will be glad of such competent people and will gather nuts peeling them beforehand and store in some depository or storehouse. But here again they will be advised that before storing nuts in a storehouse or a barn it is better to dry them properly, otherwise they will become damp and rotten from moisture. Then they will start drying them and then following the knowledge they have got from competent people they will use right methods for their storage. And now agricultural wizards will tell that these people know how to gather and store nuts, however they have not seen flaws which may be within the nuts yet. Nut pickers may wonder about what is needed for it? It is necessary to crack walnuts after which it may be discovered that there are many spoiled, empty, rotten, bitter and nuts of no use. When all the nuts will be sorted out there will remain only good ones. And again the specialists will say that these people have learned to sort out best nuts but still they have not seen genuine nuts. But why, will wonder those people what should we do now? It will be necessary to peel off a thin pellicle covering the nut. Only then it will be seen in its real essence. Thus nut pickers have learned the process of gathering from the start till the end. And yet at the end they will be told that they still do not know the taste of oil which these nuts contain because they have not tasted them. These people will be asked to taste the nuts and they will eventually perceive their taste. After such lesson they will need not any teacher, they will act according to the knowledge they have received. If such teaching of people to gather and preserve nuts is wrong or it is forbidden, then teaching people to perform Tariqah wirds is forbidden too. May Allah make us wise to do everything good and may He put us on the right track! The words of those who assert that Ghazwah has ended with Imam Shamil and Tariqah with ‘Abdurrahman Sughuri contradict Shari`ah, the Qur’an and Hadiths. Even if we think that Ghazwah has been completed with Imam Shamil, it will be wrong to generalize that Tariqa also has been completed with ‘Abdurrahman Sughuri. If you ask me why, I shall answer in the following way: however weak Tariqah is spreading, it is a struggle with one’s nafs which is called the great Ghazwah in Islam. Ghazwah which is waged by sabres, judged by its conditions, has an end. But Ghazwah against one’s nafs may not have the end because every Muslim after coming of age must fight with his Nafs till his last days. That is the truth and therefore it is wrong to say that Tariqa has been completed with ‘Abdurrahman Sughuri. However on the one hand there is some truth in it, but on the other hand people who say so do not understand the truth about which we shall speak more clearly inshaAllah. There is no other aim on my part here except to tell people the truth so that they understand it. 3. Salman al-Farsi, radiya-l-Lahu`anh d 35AH buried Madaa'in, SA. 4. Qasim ibn Muhammad ibn Abu Bakr d 107AH buried Madinah SA. 5. Jafar as-Sadiq, alayhi-s-salam (after which moves to Iran) d 148AH buried Madinah SA. 6. Tayfur Abu Yazid al-Bistami Bayazid Bastami, radiya-l-Lahu canh d 261AH buried Bistaam, Iran (804 - 874 CE). 7. Abul Hassan Ali al-Kharqani, qaddasa-l-Lahu sirrah d 425AH buried Khurqaan, Iran. 8. Abu Ali al-Farmadi, qaddasa-l-Lahu sirrah (after which moves to Turkmenistan) d 477AH buried Tous, Khorasan, Iran. 9. Abu Yaqub Yusuf al-Hamadani, qaddasa-l-Lahu sirrah d 535AH buried Bayram-Ali, Mary, Turkmenistan. 10. Abdul Khaliq al-Ghujdawani, qaddasa-l-Lahu sirrah d 575AH buried Ghajdawan, Bukhara, Uzbekistan. 11. Arif ar-Riwkari, qaddasa-l-Lahu sirrah d 616AH buried Reogar, Bukhara, Uzbekistan. 12. 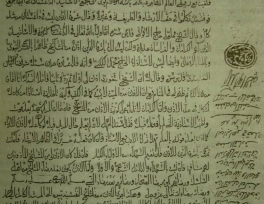 Khwaja Mahmoud al-Anjir al-Faghnawi, qaddasa-l-Lahu sirrah d 715AH buried Waabakni, Mawralnahar. 13. Ali ar-Ramitani, qaddasa-l-Lahu sirrah d 715AH buried Khwaarizm, Bukhara, Uzbekistan. 14. Muhammad Baba as-Samasi, qaddasa-l-Lahu sirrah d 755AH buried Samaas, Bukhara, Uzbekistan. 15. as-Sayyid Amir Kulal, qaddasa-l-Lahu sirrah d 772AH buried Saukhaar, Bukhara, Uzbekistan. 16. Muhammad Baha'uddin Shah Naqshband Baha-ud-Din Naqshband Bukhari, qaddasa-l-Lahu sirrah d 791AH buried Qasr-e-Aarifan, Bukhara, Uzbekistan (1318–1389 CE). 17. Ala'uddin al-Bukhari al-`Attar, qaddasa-l-Lahu sirrah buried Jafaaniyan, Mawranahar, Uzbekistan. 18. Yaqub al-Charkhi, qaddasa-l-Lahu sirrah d 851AH buried Charkh, Bukhara, Uzbekistan. 19. Ubaydullah al-Ahrar, qaddasa-l-Lahu sirrah d 895AH buried Samarkand, Uzbekistan. 21. Darwish Muhammad, qaddasa-l-Lahu sirrah d 970AH buried Samarkand, Uzbekistan. 22. Muhammad Khwaja al-Amkanaki, qaddasa-l-Lahu sirrah (after which moves to India) d 1008AH buried Akang, Bukhara, Uzbekistan. 23. Muhammad al-Baqi bi-l-Lah (Mohhammad Baqi Billah Berang), qaddasa-l-Lahu sirrah d 1012AH buried Delhi, India. 25. Muhammad al-Masum, qaddasa-l-Lahu sirrah (1007 AH - 1096 AH) buried Sarhand, India. As we have stated above Naqhsbandi Tariqah springs from The Prophet (pbuh) and goes without break to Isma’il Kurdumeri (the branch which is active in Dagestan). He is the 31st in the chain (Silsilah). After him the chain has bifurcated as he had two successors (Ma’zun) – Muhammad Salih Shirwani and Khasmuhammad Shirwani. From Muhammad Salih (he is the 32nd) the chain has reached Hassan-Afandi from Kahib (he is the 38th in Naqshband branch). From Khasmuhammad Shirwani it was passed to Muhammad Yaraghi, from him to Jamaluddin Kumukhi, and he was followed by Mamadibir Rotschi, ‘Abdurrahman Sughuri and Imam Shamil. ‘Abdurrahman Sughuri had given permission to Muhammad-Hajji from the village of `Oboda and to Iliyas from Tsudakhar (as it was narrated by Shu’aib-Afandi from Baghini). ‘Abdurrahman Sughuri had no other successors except these two above-mentioned, though Fir-Muhammad from Khushtada village deserved to be called `Obodi’s successor, according to Baghini. The 35th successor in the branch which goes through Ismail Kurdumeri is Mahmud-Afandi Almaliyi Daghestani and with him the Silsilah bifurcates. One branch goes to Jabrail-Afandi, then to ‘Abdurrahman-Hajji from `Asab, from him to Hassan-Afandi. The second branch which went through Ahmad Talali reached Shu’aib-Afandi from Baghini. He taught Hassan-Afandi who visited him after death of ‘Abdurrahman-Hajji from `Asab, the two remaining Tariqah levels (i.e. Muraqabah-Khafi and Akhfa) which were not taught to him yet, and made him his successor. Shu’aib-Afandi had no other successors except Hassan-Afandi. Hassan-Afandi said that Mustafa from Ghodoberi was Naqshbandi Shaykh too. I do not know from which side the chain had reached him. Mamadibir Rotschi said that he had no disciple who had gained the level of what is in the Safeguarded Tables (al-Lawh al-Mahfooz). و قد أخبرنا بعض العلماء لامتورعين أن واحدا من العلماء قال له: أن الشيخ أُذُنْ السلطي قال له: أن الإذنَ و الإجازة من الشيخ الثغوري لم يكن لأحد من الناس، و لم يأذن له أيضاً في مدّة كونه في دار الحياة، بل قال إنه قال له قبل موته بأيام: يا ولدي، لم يحصل من مريدي و لو واحدا يأخذ عصايا، لكنه قال إن له إذن من روحانيته. Uzun-Hajji from the village of Salta confirms that ‘Abdurrahman Sughuri had no successor and that he had given permission to no one. He personally told about it to Uzun Haji few days before his death, “My son, none of my Murids have gained such level as to accept my staff”. Uzun Hajji also tells that after death ‘Abdurrahman Sughuri’s soul (Rawhani) gave him permission. Permission for teaching is not true if it has been given in a dream or by a soul. The permission must be given in real, directly by a Shaykh who has the right for it. Sufi books tell so. But the truth is known only by Allah! May radiance fill the graves of abovementioned Shaykhs and may we have their bliss! Uzun-Hajji from Salta village, Muhammad-Hajji from Kikuni village and Hajji Musa had no permission for teaching. They had no papers confirming it either, which was acknowledged by themselves also. و أما إلياس الزدقاري فقد أقرّ في رسالة "سلّم المريد" بأن الشيخ الثغوري أذن له و لم يكن معه أحد يشهده. و لا يخفى أن الخلافة أمر عظيم لا تثبت بمثل هذا الخبر فتدبّر. Iliyas from the village of Tzudakhar writes in his book “Sullam ul-Murid” that Sughuri gave him permission for teaching. However there was no any eyewitness who must be available when giving it for the confirmation of authenticity of permission. Iliyas from Tzudakhar is told to be a true theologian. His Divine Service was true, he was able to oppose his Nafs and to work over revival of the heart. He had reached his degree. ‘Abdurrahman Sughuri had given him permission and Iliyas taught people on the way of the truth. Then he was exiled to Siberia. He was there for some years and died after returning home in 1312 AH. May Allah have His mercy on him! “A meeting (Majlis) of Daghestani theologians and Shaykhs took place in Istanbul. Tariqah, irshad and other issues were discussed here. Sharafuddin from the village of Kikuni said in his speech that there was no perfect Shaykh (Murshid al-Kamil) in Daghestan. Then ‘Ali-Hajji Akushinski answered him in the following way: “There are quite a lot of Awliyas and Ustazes in Daghestan possessing abilities of inner vision (Firasah) and performing marvels (Karamah), however you, Sharafuddin, have no permission either on the side of Shaykhs, or on the side of Shari`ah, or on the side of Rooh, same with your teacher Muhammad-Hajji who too has no permission”. ‘Ali-Hajji went on, “When my Ustaz Iliyas from Tzudakhar spoke with your Ustaz he admitted that ‘Abdurrahman Sughuri gave him permission in the beginning but then he said, “I am afraid that you will not be able to bear it and will perish spiritually. It is better for you to leave it”, and took back the permission. He said subsequently that he got permission in a dream. Thus your Ustaz claimed that the permission was given to him in a dream. So long as a dead man cannot give permission in a dream it is not valid. How do you consider a teacher a man, whose permission is so doubtful, Muhammad-Hajji? Besides, ability for performing marvels does not mean that you have permission for teaching. If a Murid does not declare permission of his Ustaz during his lifetime but does it after his death, it looks as if it casts a shade on Ustaz as if suggesting about his imperfection. Sharafuddin, if you argue about permission you must have evidence on the side of great Awliyas, people directly related to this problem. Or if you tell that Murshids with such right witnessed verbally your permission, you must have eyewitnesses. Also you must have Shari`ah foundation, otherwise there may be no permission. If we talk about permission it must be given by consent of Murshids composing the chain of Shaykhs. Their consent follows permission which was received from The Prophet’s (pbuh) companions. Permission of the Companions is possible after the permission of The Prophet (pbuh) himself and his permission is permission of Allah by His will. It is the order through which the permission was received from Naqshbandi Shaykhs by ‘Abdurrahman Sughuri, then from him by Iliyas of Tzudakhar village and from him by me. Don’t now I have the right to teach people Tariqah?”. Then Sharafuddin replied ‘Ali-Hajji, “Yes you are right, you have”. At the end of the meeting Ja’far Sadiq said, “Sharafuddin was not able to give any answer at this meeting where many people had gathered”. Ja’far Sadiq swears by the name of Allah that this story is authentic and everything was exactly like this and he asks us to accept it and not to reject it. It follows from the letter that this story took place in 1324 AH. Let those who understand read it in the original and let them correct me if I am wrong. May all the people receive `Obodi’s goodness! He is characterized in the following way: common folks and even theologians compared him with Junaid al-Baghdadi and Abu Yazid al-Bastami in his deep comprehension of The Qur’anic text, Hadith and secret sciences. Being a man of such high level he migrated to Turkey after discord became more frequent in Dagestan. His status did not allow him to stay here longer too and he went to Madinah. He stayed here for some time and soon went to Makkah. He said that he left Madinah because Makkah was more precious and he wished to die there. He died there in 1307 AH and was buried in the “Mualah”graveyard where the grave of The Prophet’s (pbuh) wife Khadijah is situated. The reason for his leaving Dagestan was that it was not possible to call people there to do only good deeds and to abandon evil deeds. Also there was not anyone who could always support him and render him help. Here I have mentioned very little about Karamats of ‘Abdurrahman Sughuri and `Obodi. The book “Tabaqatu Baghini” tells much about them and about other Dagestan theologians, Awliyas and Shaykhs. Let anyone who has such possibility read it. و لقد أخبرنا العالم المتورع حجيو البقّجّي أن العالم الكاتب مهمد نبي ولد العالم شَهَوْ أنصُخي قال له: إن رجلا أخبره بأنه ذهب لدي الشيخ الثغورري مع رجل آخرلطلب الإذن لمحمد حجيو العبودي من طرفه، فقالا له نحن نطلب منك أن تأذن للعبوديللتلقين و الإرشاد، و لطلبه منك جئنا لديك. فقال لهما: يا أولادي، كيف أجيز له مع أنه ليس لي إذن. فحين رجعا من عنده قال الرجل لصاحبه: نحن نقول للعبودي أنه أعطى له الإذن و الإجازة، فقال: إني لا أقدر أن أكذب. فقال الرجل له: أنا أكذب، و أما أنت فكن ساكتا. فكذب ذلك الرجل عنده و سكت صاحبه. فهذا كيفية ما وقع في حق العبودي. و من المعلوم أن ذلك العالم المذكور الأنصخي من تلامذة الشيخ العبودي لا يريد أن يقول فيه إلا ما كان حقا، ففهم... الخ. و ايضا، أخبرنا ذلك العالم حجيو البقّاجّي بأن الحاج محمد البقّاجّي الذي كان صاحبا العبودي في سفر الهجرة قال: أحمد ضياء الدين قدس سره سلب حاله بالكلية. و قال أيضا" إني كنت مع العبوديّ في مجلس غوث الثقلين إسماعيل الجُّوخي، فقال له الغوث: يا محمد حجيو، إنك عالم و زاهد و لكنك لست بمرشد، فقف قبالتي مع الإعتقاد لأتوجّه إليك، فوقف العبودي قبالته و وتوجّه إليه و لم يتأثّر له بتوجهه بشيء. ثم قال الغوث لواحد من الجلساء إذهب إلى خارج البيت و خذ الحجر الذي هناك، فجاء الحجر لديه فوضع قبالته فتوجّه إلى الحجر و نحن ناظرون، فصار الحجر كالغبار بأثر توجّهه. ثم قال الغوث نحن أشدّ قسوة من هذا الحجر. و سمعت شيخنا العسلي قدس سره يقول: إنه قال للعبودي: لم لا تلون الذكر القلبي على قاعدة المشآءخ النقشبندية؟ فقال له: يا ولدي، إن إناسا كثيرا يجيئون لدي و لا أطيق أن أتوجّه إليهم، فلو منعتهم بالكلية رجعوا آئسين، و لو لقنت لهم الجهري يظنون أنهم صاروا مريدين و يكون ذلك سببا للإجتناب عن المعاصي، و لذا أالقن لهم الذكر الجهري. و سمعت شيخنا ا؛مذكور يقول أيضا: إن العبودي قال له: ليس لي مريد في الداغستان إلا أربعة رجل. و مع هذا كان الشيخ العسلي يثني ع؛يه ثنآء كثيرا، و يقول إنه كان عالما كبيرا... الخ. A scholar Hadjiyav from the village of Batlaitsch narrated from the words of a scholar Shaav Muhammad Nabi who copied The Qur’an by hand, the following: “Two men came to ‘Abdurrahman Sughuri and told that their aim was to take permission from him for Muhammad-Hajji `Obodi for his teaching. Sughuri answered them, “Oh, my sons how can I give him the permission which I have not myself?” (It is meant here that Sughuri has no right to give `Obodi permission for teaching. It does not mean that Sughuri himself had not permission. Remember that!) One of the friends proposed other one on their returning home, “Let us tell `Obodi that Sughuri has given him permission for teaching”. His friend answered him that he would not tell such lies. But he did not quit that and began again,”Let me tell lies but you will keep silent”. And they did exactly so, one friend lied the other said nothing.” They say that Muhammad Nabi from the village of Antzukh who narrated this story was among `Obodi’s pupils (Muta’allims). Muhammad from the village of Batlaitsch that we have mentioned before, said that he and `Obodi together were visiting Ismail from the village of Tschokh who is considered to be a Wali of the highest rank (Ghawth Saqalaini) above people and Jinns. Other Alims were present there too. Ismail from Tschokh asked `Obodi, “Muhammad-Hajji, you are a great and ascetic theologian (Zahid), but still you are not a Murshid”. Then he asked him to sit down opposite him with due conviction in order to direct his spiritual sight (Tawajjuh) to `Obodi’s heart. He sat down. But it did not have any effect on `Obodi’s heart. Then Ismail from Tschokh sent one of the present people out to bring a stone. After the stone was brought Ismail put it before him and it crumbled to dust before the eyes of the present people. Then he said, “Our hearts are stronger than a stone”. ‘Abdurrahman-Hajji from the village of `Asab said that one day he told `Obodi, “Many people visit you, but why don’t you teach them Naqshbandi Zikr which is read by heart?” `Obodi answered, “Oh, my son, really many people come to me, but I have not power to look at them by a spiritual glance (Tawajjuh) but if I send them out without anything they will be sad , therefore I have to teach them oral Zikr and they go home thinking that now they have become my Murids. So thanks to it they stay away from undesirable deeds (Ma’siyah), and this is the reason why I teach them oral remembrance of Allah”. Also `Abdurrahman from Asab used to say that `Obodi said he had only four students in Dagestan, and described him as a great Muslim scholar. Dear Muslims, you can see from these stories given here how many doubts Islamic scholars have concerning the right for teaching People Tariqa. All scholars who we spoke about and mentioned here were vast seas of knowledge. There is no one whose words we might have doubted among them. Anyway it would be unjust to accuse me of telling the things which they said themselves. Though I did not want to talk at length about these great theologians I have got to do it because of the statement concerning that the Tariqa has ended on Sughuri. We may see from their own words that there is no branch (Silsilah) from this side. However they have missed the moment where it is mentioned that the silsilah branch from Ismail Kurdumeri on the other side continues and goes on without break through Muhammad Salih. But they reject this branch of the chain and more than that they have been slandered as dishonest people. To tell the truth we must give praises to The Most High for He has endowed us with His grace from this side whereas the branch going from Khasmuhammad Shirwani has been broken. If the chain was broken here and there we would have been abandoned and like our neighbors, would been very poor concerning matters of religion. It perplexes me to hear the words of those who assert that Tariqa has been completed on Sughuri or on `Obodi and along with it they say that there are `Obodi’s successors who allegedly spread Tariqa by his authority. All right. Let us assume that Tariqa has been completed on `Obodi, but how can he have successors who spread Tariqa? Recently “Haqiqat” newspaper published a poem of Muhammad Hussaini from Ghigatl which was written in those times. May be you have noticed it too. I have been read it too. Even from this poem it is clear that Muhammad Hussaini does not agree that `Obodi might have successors. Also there is a group of Darghins insisting that after ‘Ali-Hajji Akushinski there was no and there is no one who might teach Tariqa. All of them reject existence of Tariqa branch on the side of Ismail Kurdumeri though the chain which had been passed on to him by his ancestors is alive and going on today, and is being passed on without any changes through authentic permission for teaching. These people also teach Wirds which correspond to the ones pointed out in books. When these people who claim themselves as Tariqa people are asked what Tariqa they follow, they answer that Naqshbandi Tariqa. But in truth they do not follow Naqshbandi Tariqa and do not know how to perform it: neither themselves nor those who teach them. Details of performing Naqshbandi Tariqa tasks, Rabitah and ethics of this way are given in the book of Jamaluddin Kumukhi “Adab ul-Marziyah”. I do not understand how those people who do not follow this book and reject those who follow it may assert that they perform Naqshbandi Tariqa. A man who personally read the letter sent by Muhammad-Hajji `Obodi from Makkah had narrated its contents: “…You follow what I have taught you if you do not find a man who will teach you Tariqa”. I have not personally heard about all these situations cited here and have not seen with my own eyes those people mentioned here. Nevertheless these stories are well known among people and have reached us from mouth to mouth. There may be people who tell all these stories contrary to what is mentioned here. Anyway everything is by will of Allah. However I know that it is ignorance on the side of ordinary people and envy on the side of learned people to accuse ‘Alims of incompetence and to slander an honest and pious man. I swear by the name of The Most High that I am not holding this conversation because of envy for the people of the past or present days. Also I swear that I am not holding it for the sake of getting more Murids. Judge for yourselves, dear Muslims, in what cases truth may not be called as the truth? There are people who perform Zikr by going round in circles and even by beating a drum or a tambourine. If they are asked about their Tariqa they answer that it is Qadiri Tariqa. Qadiri Tariqa Imam is ‘Abdul-Qadir Gilani. My dear brothers, did ‘Abdul-Qadir Gilani go round performing Zikr? Or did he clap his hands or beat a drum or a tambourine? No he did not do anything of this kind. If anybody wants to contest it let him show its source. My Ustaz used to say, “My son, a man who slanders ‘Abdul-Qadir Gilani claiming that circling in Zikr is his Tariqa, falls into a sin of disbelief”. That group of people dislike those who tell them about it. We can meet other group of people who claim that they are following Tariqa of Muhammad from Balakhani. If you ask them about where they have got it they answer that they visited his grave and got it there, or tell that they have got it from certain woman, similar to those who perform Zikr by going round. I have not heard men telling that they have got Tariqa from a woman, usually women do it themselves. And now, my brothers in belief, think over who might be more precious on the earth than our Prophet (pbuh) for the sake of whom everything existing has been created by The Most High. If it is evident that it is impossible to visit his grave and get Tariqah, may we talk about anybody’s grave at all? People do not want even to hear such words. If such women as The Prophet’s (pbuh) wives Khadija, Aisha and others, and also his daughter Fatima az-Zahrah called as mothers of Ummah did not teach Tariqa, no other women may teach it and we may not even speak about it. Is it so much knowledge necessary for a man to differentiate the truth from the lies? As we have stated above there are different paths of Tariqa, so everybody chooses what way he wants and nobody argues with it. However if there is no teacher who is a successor in the true chain of the Tariqa and who masters Tariqa basics and its tasks (Wirds) the way it should be, such path is not Tariqa but Shari`ah way. We have talked about it as well. In reality it is a very difficult, responsible and dangerous thing to start teaching people even if one has permission for it. For instance my disciple whom I taught Tariqa will be asked in the Day of Judgment about who taught him Tariqa. Then he will show me and he will be relieved of all responsibility. Then I will be asked. I also will point at my teacher and I will be relieved of responsibility. My teacher will be asked the same question. And he will point at his Shaykh. Subsequently the question going from one to other will reach The Prophet (pbuh) himself through the chain (Silsilah). Then all who have entered this chain will find themselves on the path of the truth and will be saved. However a man who has no permission and does not belong to the chain is like a manager who has taken management into his hand without permission, neither with special documents, nor with permission from above. I heard how my teacher said about it. Most likely there will be people who will say that I favor disunity among people by saying such words. But they would be right if I tried to split an already existing unity. Am I not holding this conversation because of disunity of Muslims?! Otherwise if there was no disunity I should not have any necessity to talk about it. Those people who can give ten times more examples on this issue and possess ten times more knowledge than me, understand its essence, are able to perfectly elaborate on this problem and are keeping silent, but not because they don’t exist. I do not know, maybe they have no time for it or even if they have time, perhaps they take care of their mouths, heads or wish to be seen good for everybody but they tell nothing about this problem. So let me be bad in the eyes of those who have misunderstood me. It does not upset me for the reason that Allah Omniscient and Omnipotent sees everything. May The Almighty guide everybody to the path of truth! We have already said that Muslims always have had such disagreements. Consolidation of all Muslims into one Tariqa is not real either. It is time now to see that all Muslims following whatever path they have must unite for the sake of preserving peace and brotherhood. This is my only aim, may AllahThe Most High help! Now let us return to the letter of Jamal Hassanov from the village Khindakh of Khunzakhski District. Jamal, my brother in belief! You write in your letter, “To my mind it would be best to struggle against Wahhabies as much as possible and to keep to the pure Shari`ah and Islamic way”. Jamal, you think the right way. We need not more anything than that. However we shall not do without Tariqa if we want to spread Shari`ah. For example is it enough to speak about using technology and machines, for instance, cars if we hush up about petrol and machine oil, thinking that they are not necessary for a car? But if we do not use these two components the machine will not work! Besides in order that machine works without interruption fuel must be pure, without any admixtures for if we use dirty petrol equipment will break soon. It is not a plant producing petrol to be blamed but the people who mix it with some other things. Today, Jamal, this example, example of Islam resembles the machine which vile people fill in with dirty petrol and oil. However even so, my heart is peaceful, Jamal, for Islam will be pure like clear sky, and all who are alive will see it, inshaAllah. Kusai-Afandi narrated that when he was performing Hajj he asked a question to Daghestani Shaykh Yahya Beg who had migrated to Makkah, “Oh, Ustaz, now our Daghestan is in the hands of infidels. There is no Imam Shamil’s former power. Need we not to migrate to Islamic lands?” He answered me, “Oh, my son, there is no such obligation for us and we may not do so. I swear by Allah I have a hope that from now on everything best will be in Daghestan”. Shaykh Yahya Beg possessed manifest and secret knowledge (Zahir and Batin). Besides he was a perfect Shaykh (Shaykh ul-Kamil). He was 130 years old when this conversation took place! These words inspire hearts of believing men with joy, is not it so?! Jamal, there is a dubious moment in your letter too. Whoever of Avar people you listen to in Daghestan it turns out that all of them have visited one or another Shaykh and have entered Tariqa. But actually it is difficult to understand what kind of people they are and at what level they are. Jamal! Self-restraint of a man in everything is a good thing, it gives rest to a heart. It is known that it is especially good and valuable in service to Allah for with it the service is perfected. However there are some moments when a man is rewarded equally for some deed performing it knowingly or unknowingly. For example there are many men working in a factory. Every worker is given a task by an engineer to make some part. The worker completes his task without knowing for what purpose the part is made. He gets reward for it depending on how fairly he completes the engineer’s task. A man is a lawful and respectable worker of the given factory provided that he performs fairly the task given to him, and his work is duly estimated at a corresponding level. However if some people take up a work without teacher, each doing what he can, what will come out of it? Jamal, those who perform Tariqa task under the instruction of a Shaykh are like the workers performing the task of an engineer. But the example of those who act at liberty resembles that of the people who work alone without any engineer, and not all of them are able to do it either. Think over, Jamal, what is more advisable: to perform a task which is given by your teacher or to do a task not appointed by anybody? But will not the result be more perfect if there is a man who teaches you, Jamal? Will not such order be like gilded silver or radiance spread over other radiance? Jamal, please think over the following words too. In our village Chirkey there lives a man by name of Mukhtar Saifullaev. He is a good organizer and has positive attitude towards Islam. He administered the building of Chirkey mosque together with Hussain Nuruddinov. He also had connections to Daghestan Muslims Board. He told me the following, “I had met with Muhammad-Hajji Abav from the village of Artlukh when he was Mufti. He told me during our conversation, “Mukhtar, I am not ‘Alim, I am a driver”. I thought about whether a simple driver, not even a scholar may be assigned as Mufti? After some time Abav resigned from his office and ‘Ali from the village of Kuletzma was elected to the office. When I was speaking to him he said, “Mukhtar, I am not ‘Alim, I am a carpenter”. Now Mukhtar telling this story asks me, “Why, don’t you have any scholar, are all of them drivers and carpenters?” I answered Mukhtar, “Mukhtar I was also a shepherd, and I don’t know…” Here we both laughed. Think, Jamal, why did Abav and ‘Ali-Hajji said that they are only a driver and a carpenter but not ‘Alims? What was the reason of their self-detraction? Well, the reason of it is their Tariqa! A man who is a slave of his own Nafs, argues with Imams, and creates discord never will utter such words even casually. However I will not say that all of them who are in Tariqa are like Abav or ‘Ali-Hajji. Nevertheless as we have said before we may not blame the whole of medicine or doctors and close hospitals because patients misuse their prescribed medicines. There is no doctor who is able to cure incurable disease. Jamal, you continue, “Said, I know that my letter for the scholar of your level well known among people is worth only throwing out like a used match”. Jamal, probably there are such scholars about whom you have thought like that, but I swear by Allah Who has created me, I do not think that I am superior to you in my knowledge or deeds. Whatever great knowledge or deed a man has, he may not rely only upon it. My friend, I have read your letter, have appreciated it and have not thrown it out. Jamal, May Allah allow us no popularity among people, for there is poison in this popularity! May The Most High safeguard us against it! Jamal, you ask Allah the same thing for me too when you remember me, and my du`a for you is permanent if it is accepted by Allah. Then, Jamal you advise me to read `Obodi’s book “Kanz ul-Ma’arif” . I have had the following story with it. In 1970-es when Chirkey hydropower station was being built I worked as a security guard. Another guard like me was working in other unit, his name was Muhammad, hailed from the village of Amushi. We often met with each other and besides we were good friends. I was studying religious books at that time. Muhammad was a man who respected `Obodi and we often talked about him. Especially he talked much about his book “Kanz ul-Ma’arif”. I asked him to bring the book with him but in spite of his promise to bring it he did not do it, many times as he went to his village and I do not know why. After that I left the work, Muhammad (may The Most High forgive his sins!) died and I met nobody who spoke about the book and the question was left open. Jamal, you assert that `Obodi said, “Perform Shari`ah Wird and follow The Prophet’s (pbuh) Sunnah”. To say it sincerely I am dubious of the authenticity of these words if we take into account `Obodi’s words in the letter which he wrote in Makkah, “…you follow the words I told you if you do not find a man who will teach you Tariqa”. I have been told about it by a man who himself read the letter. He mentioned that you can find it also in the book “Kanz ul-Ma’arif” and he is trustworthy for he is not from those who can tell lies. Jamal, please understand one thing: even if `Obodi bade to perform Shari`ah Wird there is a deep meaning in it. It is characteristic of the people who have approached Allah to tell something considering the features of a place, time and people. It could not be otherwise because `Obodi would never reject Tariqa or say something casting a shade on this path. If he put such meaning into his words he would have frankly called to consider false and useless the doctrine of his teachers ‘Abdurrahman Sughuri, Jamaluddin Kumukhi, Muhammad Yaraghi and others. He would have called not to follow them like Wahhabies. However he did not do it. Think it over, Jamal. There is one more moment which needs special attention. For example the names of Imams of the four Mazhabs are not mentioned among people of Irshad, that is they are not in the Tariqa chain. The words of Imam Abu Hanifah “If I did not enter Tariqa in the last two years of my life I would have perished” do not mean that he speaks about himself as Tariqa Ustaz. He confirms that he had become a Murid who had taken a task from Shaykh. Think, Jamal, whether he had become imperfect or less significant after that with regards to knowledge, character, way of life, detachment from this world, spiritual purity and piousness (Wara’, Taqwah)? No, my brother, he did not become such man as well as significance of religious scholars does not become less because they are not teachers on the path of Irshad. Jamal, I am holding this conversation with the hope that at least you will understand that we do not criticize the peaks of knowledge of Daghestan ‘Alims for there are people who think so. The teachings and Barakah of these ‘Alims still can be felt even today in Daghestan. Now Jamal, here we may complete our conversation around issues you have raised in your letter. With my best regards and with hope for your du’a, Said from Chirkey. 2. Ali ibn Abi Ṭālib, radiya-l-Lahu`anh (598/600 - 661 CE), buried Kufa, Iraq. 3. Al-Hasan ibn `Ali ibn Abi Talib, radiya-l-Lahu`anh (625 - 670 CE), buried Jannatul Baqi`, Madinah SA. 18. `Abd as-Salam ibn Mashish (1163 - 1228 CE), buried Jabal al-`Alam, Morocco. 19. Abu al-Hasan al-Shazili (1196 - 1258 CE), buried Humaithara, Egypt. 20. Shahab al-Din Abu'l-'Abbas Ahmad ibn 'Umar ibn Mohammad al-Ansari al-Mursi (1219 - 1286 CE), buried Anfoushi, Alexandria, Egypt. 21. Taj al-Din Ahmad ibn Muhammad Ibn `Ata Allah al-Iskandari (1260 - 1309 CE), buried Alexandria, Egypt. 27. Ahmad ibn Ahmad ibn Muhammad ibn `Issa al-Barnusi al-Fasi "Az Zarrouq" (1442 - 1493 CE), buried Misrata, Libya. 29. `Abd ar-Rahman al-Majzub (d. 1568 CE), buried Meknes, Morocco. 38. Mawlaya al-`Arabi ad-Darqawi (1760–1823 CE), buried Rif, Morocco. In Daghestan there is another authentic branch of Tariqah – Shazali, the roots of which begins with the Prophet [pbuh] and reaches us without interruption. Before Saifullah Qadi this branch was not known in Daghestan. He passed the permission to teach to Hassan Afandi, and the latter began spreading the Shazali tariqah here. Hassan Afandi’s first Shaykh in Naqshbandi Tariqa was Muhammad Zakir Chistawi from Chelyabinsk region, one of the followers of Mahmud Afandi. After his death he went to Ufa. There he met with Murshid Zainullah Sharifi. Saifullah-Qadi came to Ufa by the spiritual call of Sharifi. There he perfected himself under Zainullah Sharifi who had made him his successor and gave him permission after which Saifullah returned to Daghestan. He wished greatly to know Shazili Tariqa and met with Ma’zun of Shazili path Muhammad Salih, accepted Tariqa from him and became his disciple. 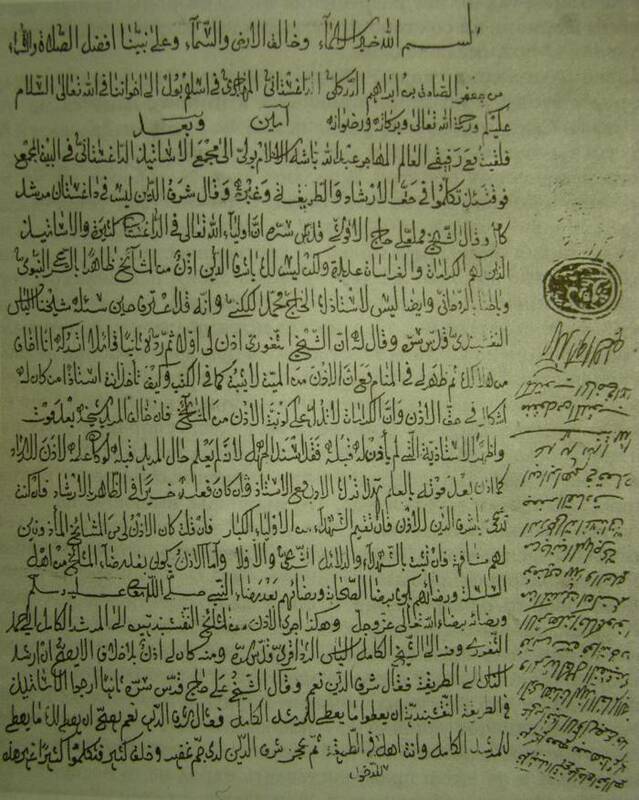 Later on Saifullah-Qadi also got permission from Muhammad Salih to teach others Shazili Tariqa and became his successor. Shu’aib-Afandi Baghini and became his disciple. He taught Hassan-Afandi the levels of Khafi and Akhfa which he had not gained because of ‘Abdurrahman Hajji’s death. Shu’aib-Afandi gave him the right for guidance (Irshad). Then after Shu’aib-Afandi’s death Hassan-Afandi became a disciple of Saifullah-Qadi who had made him his successor and gave him permission for teaching of Naqshbandi, Shazili and Qadiri tariqas. My brothers, now you see yourselves that there is no chain (Silsilah) going from ‘Abdurrahman Sughuri and `Obodi. I do not know what reason could be found to find faults with the chain which goes from Mahmud-Afandi so nicely and purely. As for me I keep to the link of the chain of the Almighty’s grace with joy and giving permanent praises to The Most High. There was no one who argued with me, showed envy to me or criticized me. I did not think that there are such people out there but it turned out that there are. اللهمّ اصلح أمّة محمّد. اللهمّ ارحم أمّة محمّد. اللهمّ فرّج عن أمّة محمّد صلى الله عليه و سلّم. اللهمّ اغفر لي و لأمّة محمّد صلى الله عليه و سلم و ارحمهم رحمة عامّة، آمين.